Pope Francis has just received a unique Lamborghini Huracan sports car, but he won’t be driving it. The pontiff, known for his humble lifestyle, has decided to auction the expensive present to raise money for the poor. 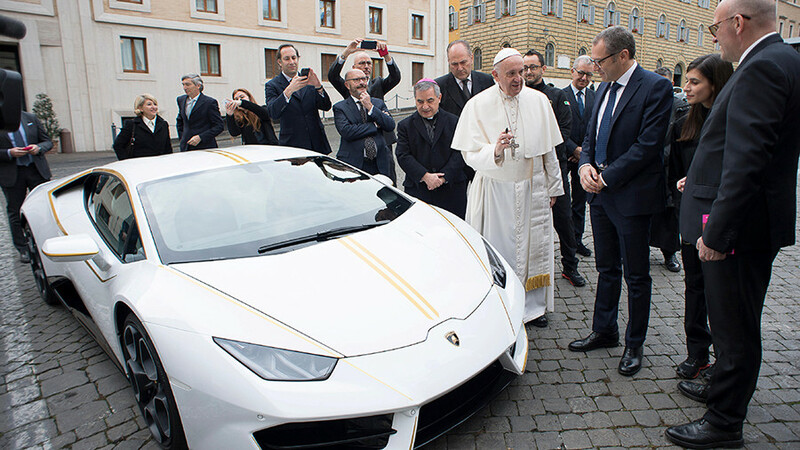 Italian luxury sports car manufacturer Lamborghini presented the lavish present to the Pope on Wednesday, according to a statement from the company’s press service. It boasted that the car presented to the pontiff is a “unique” edition. “It is painted Bianco Monocerus (white) with Giallo Tiberino (yellow) stripes that run along the body in homage to the colors of the flag of Vatican City,” Lamborghini said. Named “the Supercar of the Year 2014” by car magazine Top Gear, the Huracan can cost up to $320,000. The Pope blessed the car and signed its hood outside the Casa Santa Marta, his residence. However, the 80-year-old head of the Catholic Church said he won’t keep the supercar, and handed it over to Sotheby’s auction house. The auction will take place in May 2018, “with the proceeds delivered directly to the Holy Father,” the company said. The pontiff will allocate the money received from the auction to the Pope John XXIII and Friends of Central Africa groups. Aid to the Church in Need international group, which supports persecuted Christians across the globe, will also receive a donation after the auction. It is not the first time Pope Francis has passed on luxurious vehicles he does not need. In 2016, the Pope ordered three Volkswagen Golf cars he used during his visit in Poland to be auctioned to help Syrian refugees. In 2014, the Pope’s Harley-Davidson motorcycle was auctioned off for $327,000, with the money donated to a soup kitchen serving homeless people in Rome.